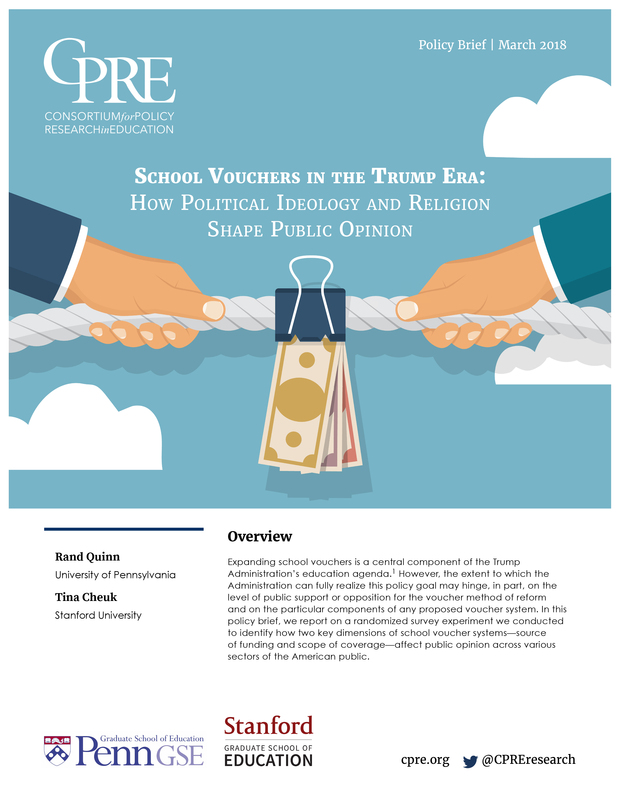 Political ideology and religion shape public options on vouchers, a new CPRE policy brief finds. More than half of American adults favor some form of school vouchers, according to a 2017 poll released this month in a newpolicy brief from the Consortium for Policy Research in Education. The poll - designed by CPRE Senior Researcher Rand Quinn (University of Pennsylvania) and Tina Cheuk (Stanford University) was conducted by YouGov in April 2017, two months after voucher supporter Betsy DeVos was confirmed as Secretary of Education and soon after the Trump Administration's proposed 2018 budget called for $250 million for the development and evaluation of voucher programs. Click here, to download the policy brief. Click here, to listen to podcast.